I hope you are all doing well and are having a wonderful weekend so far. I literally have so many exciting things to share with you but I thought today I would feature one of my all time favourite beauty brands; Charlotte Tilbury. Around a month or so ago I had a lovely weekend away in London where I met up with some friends and spent Mothers Day weekend with my parents. Family trips to London are becoming more of a tradition within the Meola household and we always make sure to do something new or discover something when we visit. On this occassion we enjoyed a lovely Mothers Day weekend, I actually snap vlogged the whole time I was there (you would have been so proud of me haha), we visited the Hummingbird Bakery and enjoyed a spot of shopping. Naturally, we visited one of our all time favourite stores which is Harrods and we enjoyed a little wonder and I even managed to pick up a few treats. I literally went in with one item on my wish list and I eneded up walking away with a few more bits and pieces - does anyone else do this?! Confessions of a shopaholic or what haha. Charlotte Tilbury has grown to become one of my all time favourite beauty brands and I am always left so impressed after using anything from the line. The Charlotte Tilbury range launched in September 2013 to unprecedented rave reviews and broke all records. I have featured a few Charlotte Tilbury products on my blog already but I am very excited to slowly but surely be expanding my collection. Firstly, I think we all need to take a moment to appreciate this exquisite rose gold packaging! If you are a regular reader of my blog then you will know my obsession with all things rose gold and I have to say that Charlotte has really hit it on the nail with this dazzling packaging. It is so distinctive and it just adds to the overall luxurious feel of the brand and it looks so stunning on my vanity. The initial item that was on my wish list before stopping by the counter was the Charlotte Tilbury Film Star Bronze & Glow which retails at £49. I had majorly hit pan on the one that was currently in my makeup collection and I wanted to pick up a backup as this is one product I seriously cannot live without. The palette is now available in two shades (Light to Medium and Medium to Dark) but I went back to my tried and tested shade Light to Medium as I love how the shades enhance my skintone. When I first purchased this palette I was instantly blown away by it and I always recommend it because it has honestly changed my makeup game. You can slim, sculpt, shorten, trim and highlight your features with this palette and I even use the shades as eyeshadow too (you can see me do this on my YouTube channel). It's amazing how a little bronzer and highlighter can instantly change the way your face looks - even when I look really pale and under the weather this palette always perks me up. The bronzer is the perfect universal blend of pearl and pigment to contour features and mimic a sunkissed complextion. The highlighter is built up from a golden base that flatters any skin tone, and uses Light Flex Technology to capture the light and radiate it our for a liminous complexion. Even though £49 is on the pricey side for a bronzer and highlighter duo this is an item I would repurchase over and over again without fail. Whilst the sales assistant was collecting the Film Star Bronze & Glow palette for me I caught sights of the lipstick stand and one shade instantly stood out to me. I don't know about you but lipstick is one of my all time favourite beauty products and I just love how they can change the way you feel. I am a firm believer that you can never have too many lipsticks in your makeup collection! Very Victoria which retails at £23 is part of the Matte Revolution range and even though they are designed to leave a matte finish on the lips they are extremely creamy, super pigmented and comfortable to wear. This gorgeous soft rosy beige shade is inspired by the iconic Victoria Beckham and I have been hooked ever since. Usually, if I'm not trying something new you will find me wearing my beloved MAC Faux lipstick which is a shade I will always love and have in my makeup collection. However, if you are looking for something a little different which has similar hues I would definitely recommend Very Victoria. This shade has more warm undertones and a slight subtle shimmer. I can't wait to wear this throughout the summer months! The final product I decided to pick up was the newest foundation to hit Charlotte's line-up, the Magic Foundation in #5 which retails at £29.50. Now, at first I wasn't completely sold on this foundation (shock horror because in my eyes Charlotte Tilbury can do no wrong when it comes to her makeup line!). When I had my makeup done for the Cosmopolitan Blog Awards back in November this was the foundation they used on me and honestly I couldn't wait to get it off at the end of the night. Don't get me wrong, I absolutely loved my makeup, however, I think the MUA put too much on my face and colour matched be wrong and it left me feeling a little disappointed with the foundation, especially because it even broke my skin out. However, never-the-less I had heard so many wonderful things about the foundation that I wanted to give it another try. The first step was being colour matched to the correct shade and we decided to go for #5 which is slightly darker than my natural skintone. When I am at my palest I can really blend out this shade and set it with a light powder and when I have applied fake tan I can get away with using it alone and enhancing my skin with the Film Star Bronze and Glow. I tried this foundation again on Easter Sunday and honestly it restored my faith in the foundation! The shade was great, the coverage was exactly what I needed, it felt light weight and it lasted all day. I felt it even wore better throughout the day when it had settled properly in with my skin - my Mum couldn't stop going on about it and now wants one in her shade haha. The Magic Foundation is a miracle in a bottle that transforms skin for all ages, skin tones and skin types. Charlotte worked on this 'hyper-intelligent' formulation for years that gives full-coverage yet feels completely weightless with all the ant-ageing and protective benefits of a luxury skin cream. It concealed all imperfections, applied like a dream and felt almost like a second skin. I would definitely consider having a handful of shades of this foundation in my makeup collection to use all year round and I am so glad I decided to give it a second chance. Overall, I have fallen head over heels for all of these products and I would recommend them to anyone. I fall more in love with the brand every time I stop by a counter and I have to literally restrain myself from purchasing every single makeup set they have available in-store and online. As a beauty enthusiast and collector I would love to own the whole line one day- a girl can dream right haha. I think the next step for me would be to venture out into Charlotte's skincare line. 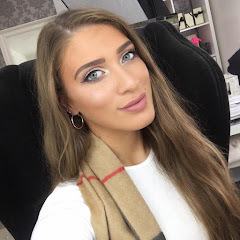 When I had my makeup done at Charlotte Tilbury in Selfridges for the Cosmopolitan Blog Awards back in November my makeup artist used the Goddess Skin Clay Mask and the ever so famous Magic Cream on me to prep my skin before makeup. They were so luxurious and felt incredible once applied and I would love to treat myself when I next stop by a counter...or if I can't wait until then I might just have to make a cheeky online order haha. The great thing when you purchase from Harrods is you earn points which can be redeemed in store - it definitely helps justify the spend haha. 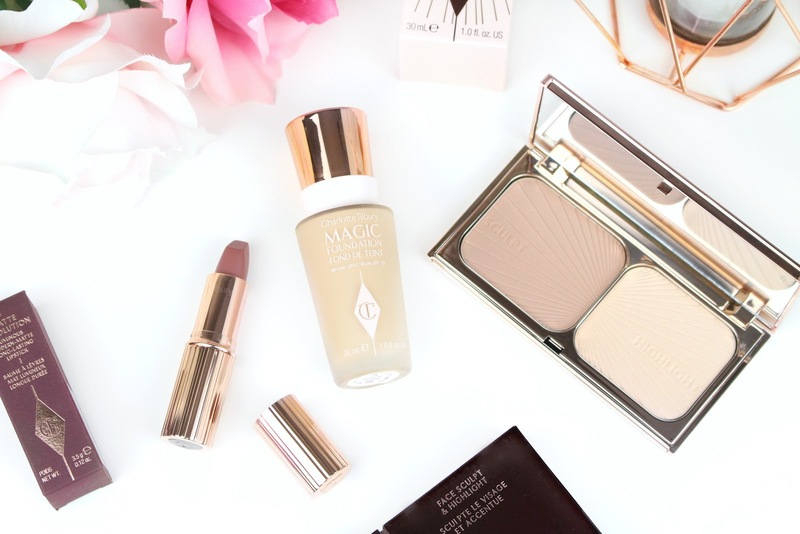 I hope you all enjoyed today's post and taking a peek at the new Charlotte Tilbury goodies I recently picked up. I would love to know your thoughts on the products mentioned above and if you have any tips and tricks whilst using them. Like always lovelies, if you have any questions, requests or if you just want to chat you can contact me on my social media or you can leave me a comment below. I love hearing from you all and I make sure to read every single comment...they honestly make my day! I hope you are all doing well and are having a wonderful Sunday. I thought today I would bring you a much-needed hair care related post as I haven't posted one in what seems like forever. I have quite long, thick and naturally wavy / curly hair, so I go through hair care products like you wouldn't believe which means I have a lot of thoughts to share with you all haha. The L'Oreal hair care range is something I have been using for years and honestly I always feel like my hair has received some extra TLC after using them. Two of my favourites that I always turn back to are the Nutri Gloss and Fibrology - I would always recommend them to anyone! However, L'Oreal have since launched another line-up to their collection; Extraordinary Clay which is a breakthrough innovation from Elvive. Now, not only does the new L'Oreal Elvive Extraordinary Clay collection look like something Queen Elsa would approve of (love the bright mermaid turquoise shade), it sounds absolutely incredible and naturally I was intrigued to see how it would work with my hair. Now, when it comes to my hair I will always switch up the products I use purely because after a while I find that my hair almost gets used to a product and starts to misbehave - anyone else find this?! I would say my hair type is quite normal but I am always on the look out to try something new that is going to leave my locks looking and feeling amazing. For the first time L'Oreal have combined 3 refined clays into a hair care range to break the vicious cycle of oily roots and dry ends. Clays have been celebrated in beauty rituals for thousands of years due to their unrivalled ability to cleanse, purify and energise. In terms of hair care, Clays combat the excessive oil production at the roots but also any dehydration throughout the lengths and ends. The Re-balancing Shampoo and Re-balancing Conditioner have been designed to revitalise the hair with softness, shine and bounciness. Oil produced from the scalp can build up causing the roots to become visibly greasy which then weighs down your hair. Over time this leads to over-washing to combat the problem which can then strip your hair of fibres which in turn leaves it feeling dry and uncomfortable - which we don't want. After using the shampoo for the first time I had mixed reviews purely because I could feel that my hair was considerably quite dry whilst still in the shower (sounds weird but you can tell by the texture), however, after following up with the conditioner I could feel the moisture going back into the hair follicles. I usually leave my conditioner on my hair for around 5 minutes or so and then brush through with a Tangle Teazer before rinsing - I would definitely recommend leaving the conditioner on your ends for as long as possible as they feel incredible after use. Even though my hair felt a little dryer than normal, the products did exactly what they were going to do - they soaked up all that excess oil (some of which probably wasn't visible to the eye) and left my hair totally refreshed and re-balanced. 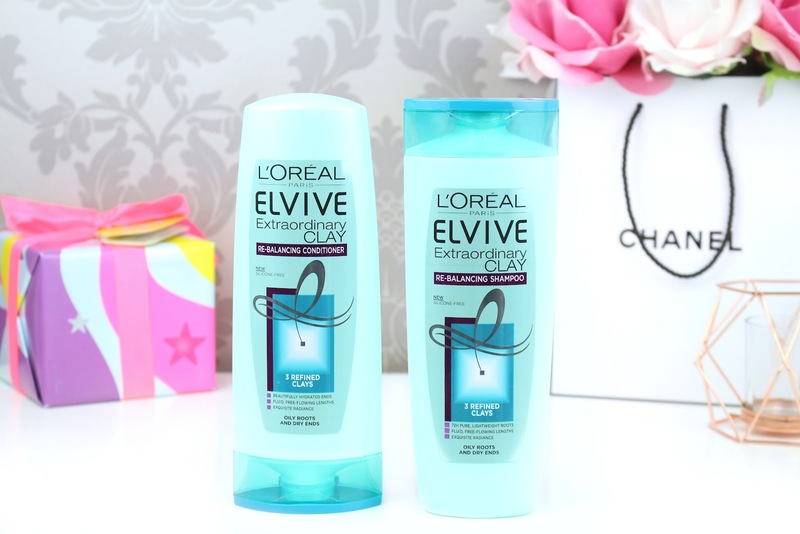 Overall, I was incredibly impressed after using the new L'Oreal Elvive Extraordinary Clay Collection and I am keen to try the Pre-Shampoo Mask Treatment and Dry Shampoo from the range also. My scalp felt deeply purified and I was pleasantly surprised to see that my roots had some lift to them - if you have long and heavy hair you will know that this is hard to come by. I tend to wash my hair every other day (sometimes every third shhh) and my hair felt great after using this duo and lasted up until my next wash. I have been using the products for around 3 weeks now and I will definitely be re-purchasing them. If you are looking for a new hair care duo that is going to eliminate greasy roots, re-hydrate dry ends and leave your hair feeling soft, bouncy and shiny like in the hair commercials I would definitely suggest you give this new collection a try. What do you think about the new L'Oreal Elvive Extraordinary Clay Collection? Would you give it a try? I hope you are all doing well and are having a wonderful weekend so far! I really feel like I have stepped outside of my comfort zone this weekend and I feel like I have overcome some personal milestones - yay! I'll save some personal updates for another post otherwise I may ramble on haha. I know I have been a little quiet these last few weeks but honestly, life has been a rollercoaster and I always want to make sure I share quality content with you, not just something I have rushed together for the sake of it. If you are ever wondering what I am up to behind the blog, I have started daily vlogging over on snapchat so you could pop on over and take a peek if you'd like. I am not feeling 100% as I've got some kind of virus but I always know I can hop on over to my blog and type away...it always makes me feel better. I thought today I would share with you a brand new fragrance from Monsoon that I have really been loving recently. I've been lucky enough to try a handful of new fragrances recently and honestly this one stood out from the very beginning. 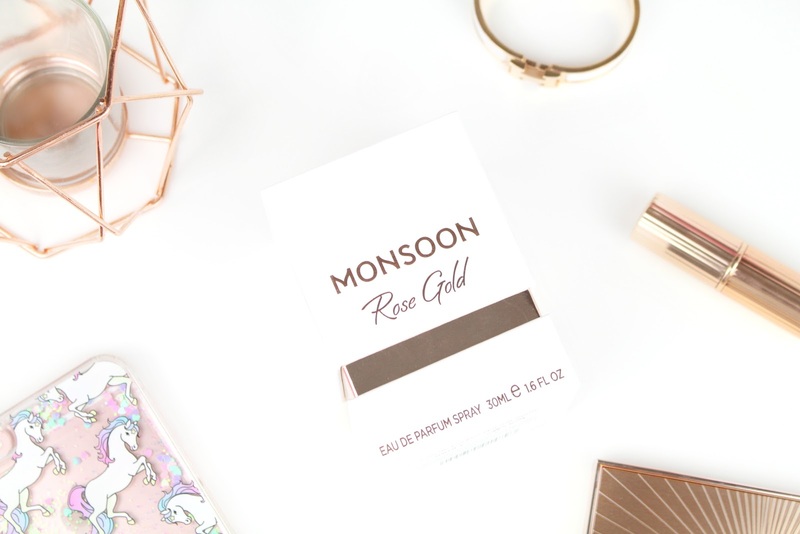 I have tried a handful of Monsoon and Accessories fragrances in the past and to be honest I haven't liked them all but this brand new Rose Gold scent is one I have really been enjoying! Firstly, I think we need to take a moment to simply admire the beautiful packaging and rose gold detailing of the perfume. The scent and the beautifully designed teardrop bottle and packaging centres around roses, with the signature rose gold colour prominent throughout. I also love how the bottle is housed in a premium heavyweight box with white and rose gold detailing - it just adds that little touch of luxury. Now, if you have been reading my blog since the beginning then you will know I have a huge obsession and love for all things rose gold. Whenever I'm out and about shopping and I spot something rose gold I literally squeal with excitement or if I spot something in silver or gold I'm usually always like 'ooh, I wonder if it comes in rose gold?!' haha. I even have a rose gold dedicated Pinterest board and when I get married I would love a rose gold engagement ring - we are getting pretty deep here! The rose gold love is pretty extreme but I can't help it, it's just so dreamy! So, when Monsoon got in contact a few weeks ago asking if I would like to try out their long awaited fragrance, Rose Gold - I literally jumped at the chance. Monsoon have worked with Fragrance and Beauty Creations Ltd and renowned perfumer Christian Provenzano to create this elegant signature fragrance. The fragrance itself opens with juicy top notes of citrus, rich floral heart notes and decadent woods which have been combined to create a feminine and sensual scent - overall, such a beautiful, rich aroma. There are also sparkling notes of lemon combined with a soft fruity accord and hints of fresh mandarin. At its heart, opulent velvety rose with tuberose, neroli and cyclamen. There is also rich vanilla, musk and amber notes which gives the fragrance a signature twist. The perfume itself is available to purchase now in-store and also online. It is available in three different sizes; 30ml at £24.00*, 50ml at £29.00 and 100ml at £35.00 which means you can find the perfect size for you. Overall, I have really been enjoying this fragrance and I have found myself reaching for it on a daily basis. I just love the whole rose gold theme to it and how it screams luxury even though it is an affordable high-street perfume. It has great staying power and whenever I smell it I always think of Jo Malone - so it could be a great alternative if you want to try something different! Whenever I review a fragrance I always wish you could smell the scent through the screen or something - how amazing would that be if that actually existed?! If you are looking for a new Spring / Summer time scent then I would definitely recommend you check this one out next time you are near your local Monsoon store. It is very light but also has a musky twist which makes it perfect for the warmer months approaching. What do you think of this new Monsoon Rose Gold Perfume? Would you give it a try?